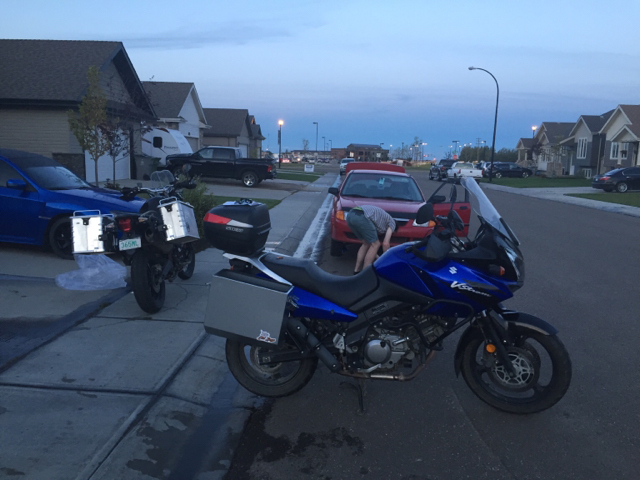 Discussion in 'Ride Reports - Epic Rides' started by Sparky.marky, Sep 12, 2016. With less than 2 weeks to go, maybe it's time I start a Ride Report. At the end of my shift on September 25, instead of heading home and continuing the routine I've developed over the past 3+ years, I'll be hopping on my motorcycle with my sights on the Southernmost tip of Argentina. 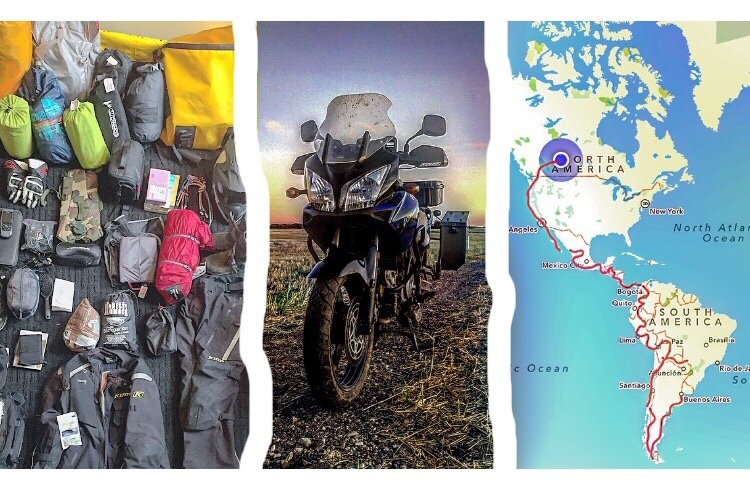 I expect to cover 30,000 km through 15+ countries (route still not decided - as any proper moto-trip should start) over the course of 200 days. The next chapter of my life is essentially the biggest blank canvas I've ever had; No more bills, no more schedule, no plans, no obligations. As of now, the only reservations I have are to make it to Portobello, Panama by December 29, as I'll be setting sail onboard the Wildcard, on route to Cartagena, Colombia to continue my trek through South America. I booked this boat ahead of time, as the Stahlratte wasn't sailing that late in the year, and the options for those of us who'd like to accompany our bikes across the Darien Gap via sea are limited and book up fast. The Wildcard staff were super informative and easy to deal with as well - thanks guys. I'm not terrific at writing, nor am I fan of having to track down wifi and sit in front of a screen while travelling. To be totally honest, I can't remember the last time I've sat down and typed this much. 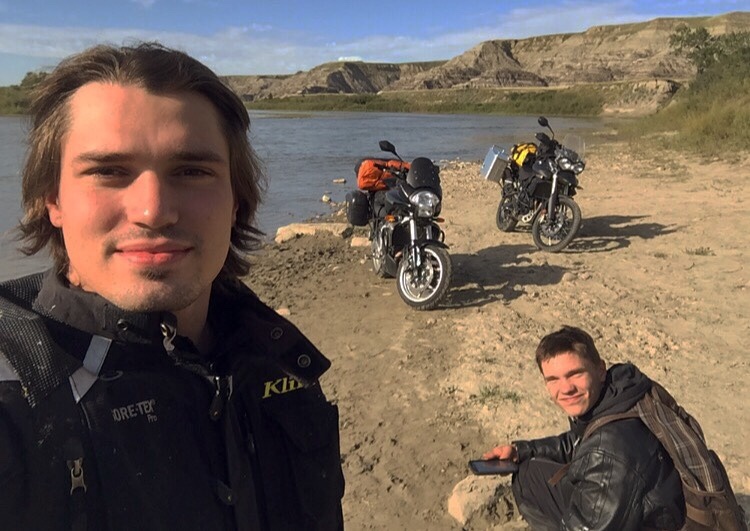 However, I've been reading ADVRider Rider Reports for years, having read countless Pan-American blogs (thank you to everyone who has taken the time to report, document, and share their experiences) and it's been a huge inspiration and part of what first opened my eyes to Adventure/Dual Sport moto-travelling. The folks on this site (as well as HUBB) are an endless supply of information, tips, and help when needed. Thanks to all those I've messaged that have messaged me back offering guidance or advice, and to all those who will be helping me along the way. I bought my first Vstrom 1000 when I was 17 or so. It wasn't my first bike, but it was my first adventure bike (prior to it I had an old Maxim 550, CB750, Boulevard c90/Intrude 1500, dirtbikes, etc. - the Vstrom is the first bike that took me internationally) and for this trip I specifically bought a well sorted, cheap, higher mileage 650 Strom. 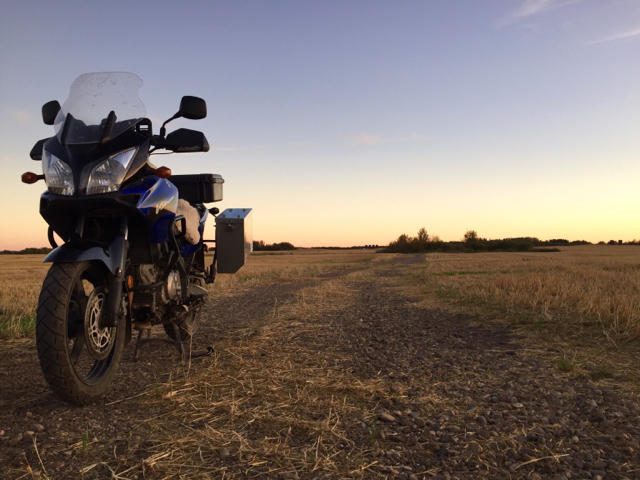 I originally planned to take my DR-650, but decided against it due to the long days I'd have onboard it, and started thinking of taking my Tiger 800 XC. I deemed this bike was a bit too new, too high tech, too flashy, and too expensive to risk taking down there, and coincidentally found a super cheap Vstrom 650 two hours from where I live, less than 3 weeks ago. Feels odd to be back on a 1st gen Vstrom, but I guess it was meant to be. As ugly, boring, slow, and cumbersome as it feels compared to my new Tiger, I'm glad I have it and being back on a strom brings back a lot of memories. If this one treats me as good as my last one did (I'd still have it if I didn't end up totaling it in Utah last may after 88,000 trouble free km), I foresee the perfect bike for this type of trip. Reliable, good dealer network, comfy on and off road, and capable of comfortably carrying myself, luggage + a passenger) For prep work, I started by renting a room from a friend, instead of an entire house, as I had been. This was enormously 'freeing', and allowed me to sell/give away 90% of my possessions that I really don't need (lawn mower, toaster,microwave, furniture, etc..), and have slowly accumulated over the years. What I now have left is kept in storage (parent's garage/basement) and consists of my high end snowboard/ski gear, some clothes, and my tools. Strangely enough, it feels really good to have less. This is probably a lot of the reason why the minimalist nature of moto-travel has always appealed to me. Having time away on a motorcycle with the ability to go anywhere, anytime, with no constraints may truly be one of the best experiences I've had in life. I also have a pile of paperwork photocopied... Just waiting on my new HealthCard to arrive in the mail. I'll post some photos in the next day or two, once I figure out how, and continue on with some of the prep work I've started, and include some notes on what I have vaguely planned/thought out. First oil change / air filter / plugs / etc. I did all this, but upon ripping the bike apart and pulling the filter and plugs out, and draining the oil... It looked like it had all just been done. Oh well, at least now I know. The brakes had reasonable life left, and the fluid looked clean. The 650 has a cable actuated clutch, unlike the 1000's hydraulic clutch, which is nice. My 1000's slave cylinder seal wore out every 30,000 km or so. My chain and sprockets look OK. Once I'm on the road, I'll have a better idea of how much life is left int he chain based on how often it needs to be tightened. Tires are brand new Tourances. I'll probably swap these for Shinko's or TKC 80's in California. 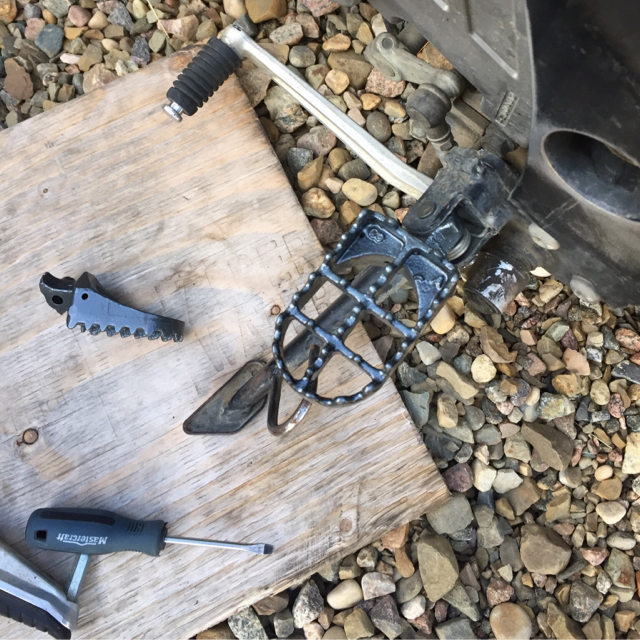 Does someone on ADVrider want a set with of Tourances less than 1500 miles? Ditched the givi knockoff for a Pelican Case. I tried finding some tooltubes locally, and considered making some out of PVC. I don't think I'll have time now at this point. I'll be working every day until my departure. 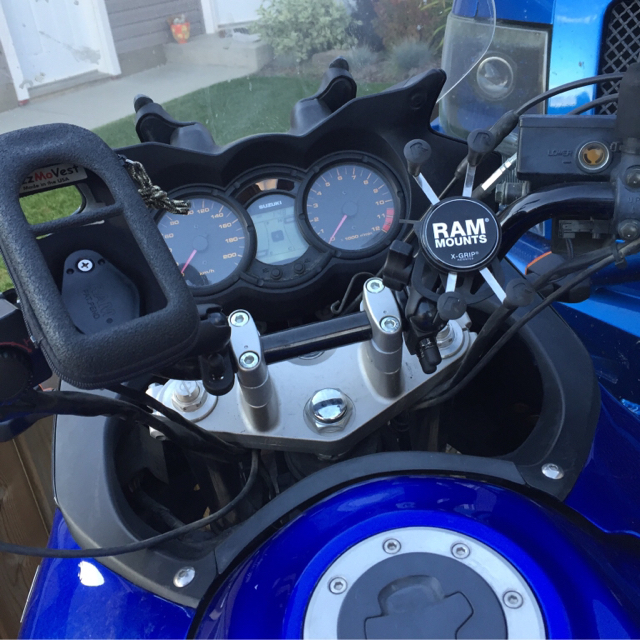 Cheap Amazon bar risers, gps mount, and phone mount. I leave exactly 2 weeks from today. The Strom is pretty much ready to go. 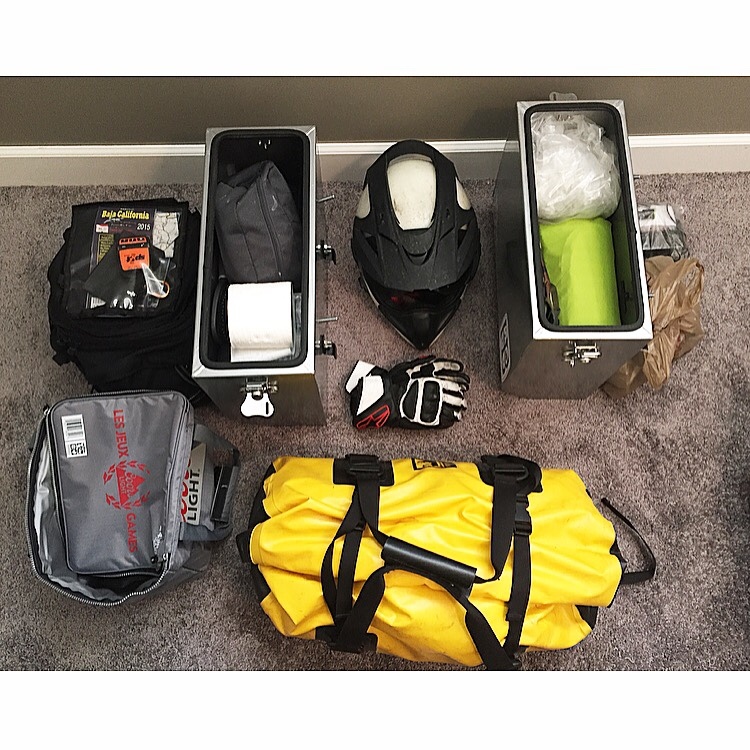 I bought it outfitted with aluminum panniers and racks, crash bars, windshield, givi topcase, and fender extender. I swapped the topcase for a pelican case. My bike still needs some USB / cigarette style chargers wired in. 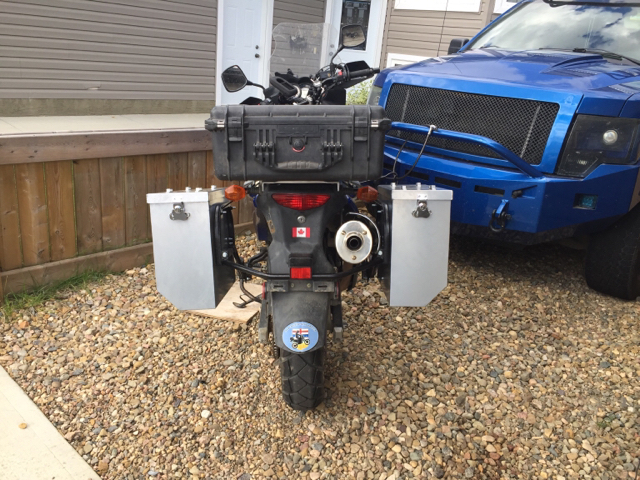 A skid plate would be nice, but on a $2500 CAD Vstrom with 59,000 km, it's hard to justify spending another $300-400, especially considering that I likely won't bring the bike back home. I also still need to register and find a spot for my spot tracker, it will probably stay in my magnetic tank bag since I keep it with me all the time. 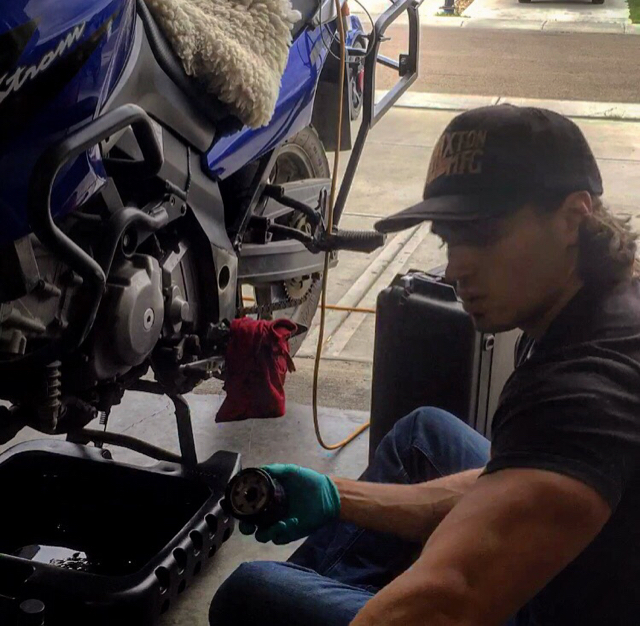 I've also been following a pile of RideReports and Instagram accounts of guys slightly ahead of me... Thanks guys, it's good to see a little bit of what lies ahead. Oznay, NSFW, PKaye and 2 others like this. First stop will be in Edmonton, on the 25th of September. The following day I have my Yellow Fever Immunization there, and once that's done I'll probably head South to Calgary and hopefully stay with some friends or family I have there. 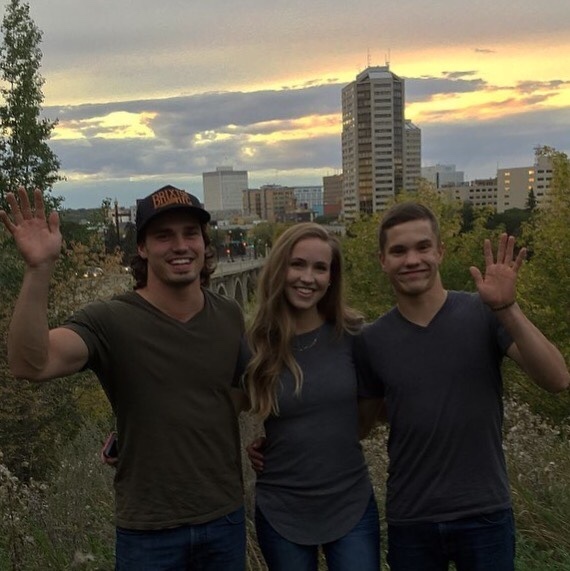 Day 3, September 27, I will head towards to Kelowna. if the weather is nice, I'll make the trip in one day. If it's not so nice I'll either stop somewhere in Southern BC and camp, or I'll just suffer through it and push on... I'm a little leery about the weather and potentially low temperatures that the end of September often bring. In Kelowna I'll probably spend a few days site-seeing, hiking, and having my last few Canadian beers. I'm picking up a passenger here, her name is Kaitlyn, and she's a part of the reason I ended up taking the Vstrom instead of the DR650. She'll be with me for 2-4 weeks, and will catch a flight home from... Somewhere. Likely somewhere in Mexico. It is her first bike trip, but she bought good gear and I told her what to prepare for, since we'll be travelling through the PNW during October; it'll likely be cold and wet. I'll be mostly camping, couchsurfing, hostelling, or cheap hotelling (once I get far enough South that the hotels become reasonable). After Kelowna we'll likely follow the west coast towards California, south towards Cabo, ferry across to Mazatlan, and then ride the old hwy to Durango. After that I was recommended to head towards Zacatecas, then San Luis Potosi, Mexico City, Puebla, Chiapas & Oaxaca.... I haven't done a ton of research, but these places were recommended to me by a friend who had spent a few years living down there. Following Mexico will be Belize & Guatemala... I'll likely do a week or two of Spanish somewhere in Guatemala and get some surfing in along the way. This is as far as I've planned, and nothing is set in stone other than my $50 deposit to sail on The Wildcard out of Panama on Dec 30/16. BigDogRaven, KneeDrachen, Outjustout and 4 others like this. borscht zanetti Pura Vida ! ... eh? jesionowski, MrKiwi and fasttortoise like this. Darel and Cmnthead like this. Awesome, I'll be following along. And as always, you have a place to hang your helmet for a few days if you need before you reach Panama City. Most overlanders are welcome to hang out for free if they need to while waiting for their crossing. Playa Uverito near Las Tablas. BIG OIL, Hoka, thechief86 and 4 others like this. Here's my SPOT tracker page. Anyone know if its possible to set the share history for more than 7 days? Thanks - headed to Edmonton tomorrow! Sounds good. I'll be following along. Ride safe. Awesome! Two of the nicest overlanders I know are from Saskatchewan but they prefer to travel in their homemade Dodge EarthRoamer-esque machine. Safe travels to you and all the best! And a free Coors Light cooler from the SLGA! Following and jealous in Regina. Edit: I ended up spending 4 hours packing, unpacking, repacking, etc. last night after work. Somehow I ended up scrambling to get ready even though I had months to prepare. Funny how that happens. The only thing I didn't get a chance to do was bleed my front brakes. I thought I had a couple containers of DOT4 brake fluid... turns out it was FORD brake fluid, same yellow container though. Oh well, it's easy enough to do on the road. I also left my Kryptonite Brake Disc lock key in my toolbox, which is in my dad's garage - 400 km in the wrong direction. I'll have to pick another one up on the road. I guess my brother just scored himself a free one since I won't be needing 2 when I return..
Brotherbear and I in the badlands during a short weekend trip this summer. He's on my old versys. He's also the guy taking care of my tiger while I'm gone. I'll probably be following your track in early 2017. Starting with a tour of the USA mid-october then back to Vancouver in nov-dec and then down South. I hope I can find a co-traveler at some point otherwise I'll go solo. Will be following your report. Good trip and stay safe! If you end up riding thru Denver, CO and need a place to stay you are welcome to stop for some cold beer, food and everything else Colorado has to offer. Found your thread just now, while beginning my almost identical route scouting for the winter of 17! Drop me a PM when you are near Los Angeles. Sounds like a great trip upcoming! Subscribed! This report should be good. Oh man, this sounds brilliant. I am along for the ride.